The Claremont Chamber of Commerce's Best B.E.T. (Business and Education Together) grant program is truly a cooperative community effort of the highest magnitude. The Claremont Chamber of Commerce’s Best B.E.T. grant program is truly a cooperative community effort of the highest magnitude. The Best B.E.T. Program recognizes the commitment of Claremont’s business community and service clubs in furthering the cause of education in Claremont. Now in its 28th year, the program has been responsible for providing $396,969+ in funding grants to develop classroom projects which address enrichment of the curriculum and promotion of student self-esteem, learning, and motivation. The Chamber would like to extend its sincere appreciation to the service club, businesses and community organizations, and individuals who have recognized the importance of support education in Claremont. Fully addresses the objectives of the Mini-Grant program in a clear and concise manner. Answers each question with a logical convincing description, including appropriate details and evidence. Fully describes plans to carry out the proposed project in a manner which assures improvement of daily learning of all students. Partnering with Claremont Sunrise Rotary, Kiwanis Club of Claremont, Rotary Club of Claremont and the University Club, the Claremont Chamber of Commerce sponsors Best B.E.T. annually, accepting applications in October of each year. 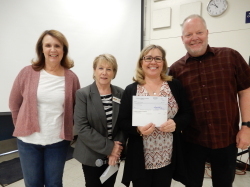 Thanks to the partnership with the service organizations, Claremont Chamber will be awarding $15,063.81+ to teachers in Claremont Unified School District! Addresses some of the objectives of the Mini Grant program. Responds to the majority of the questions with appropriate details and evidence. Adequately describes the plan to carry out the proposed project in a manner which shows promise for the daily learning of most students. Inadequately address the objectives of the Mini Grant program. Inadequately answers each question with appropriate details and evidence. Inadequately describes plans to carry out the proposed project. Does not provide for a promise of daily learning. Applications for the Best B.E.T. Mini Grant Awards are distributed to each Principal from the Claremont Unified School District and will be passed out to individual teachers. Applications may also be downloaded from the CUSD website, www.cusd.claremont.edu. Completed applications must be received by the deadline date posted on the CUSD website. Awards will be judged and checks will be distributed to teachers from December to February.